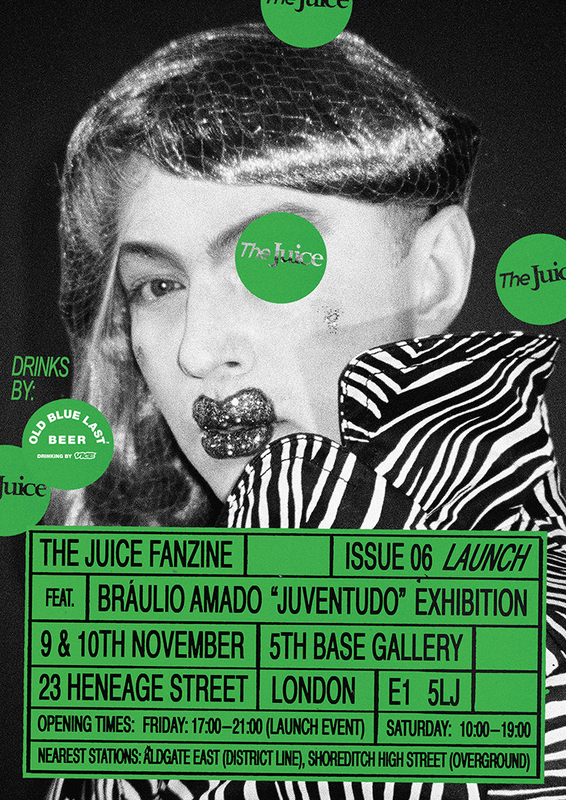 New issue of The Juice Fanzine is finally ready! “Growth” is the theme for issue 06 so we pushed ourselves out of our editorial comfort zone, reaching out to new people, some of them from communities who we felt may have been outside the scope of our previous zines. And we're also printing contents in full colour and doing a 2 day event for the first time! Alongside the zine launch we’re also hosting JUVENTUDO, a photography exhibition from Bráulio Amado, the unrelenting design & illustration powerhouse known for his work with entities such as Adidas, The New York Times and artists like Frank Ocean. Challenged by our team to collaborate with us on the zine, he politely declined a career retrospect interview and proposed JUVENTUDO instead - an unpretentious series of gritty point and shoot photographs. Candid moments compiled with a satirical take on the photography/zine world. This is the very first time Bráulio presents his photography in London. Pre-order the zine - there's an option to collect at the event with no shipping costs. Booze kindly provided by Old Blue Last Beer.